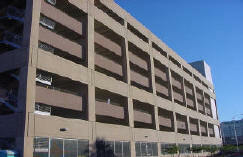 Pigeons enjoy the cool quiet environment of parking garages with all the deep ledges and easy access in and out of the garage. 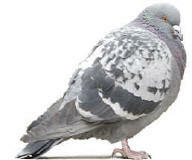 Once pigeons start nesting in a parking garage, car and truck hoods getting hit with pigeon feces is not far behind. It's not cheap up front, but exclusion is about the only way to reduce or eliminate the population and in the long run becomes very cost effective over the life of the net which should be 5 years or more. 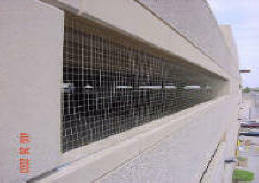 Another product that can be used is called bird slide or bird slope that is used on the ledges where the pigeons build their nest. Bird slide or slope will not cover the pipes or lights (spike would be good here) and will still allow pigeons free access to the interior of the garage to scout out nesting sites. What is nice about netting the garage is that the cable system and inserts which are most of the work and cost of the job will last many years past the life of the net, so new netting can always be attached to the old hardware. 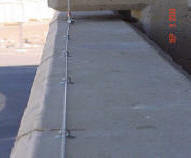 Non-Lethal low voltage shock systems can be installed along the top or side parapet walls to keep pigeons off this area as well, but don't forget to post signs warning of shock system to protect any one in the area. 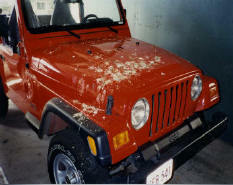 THIS IS THE RESULT - Pigeon feces on cars and trucks and slip and fall liabilities from the twigs and droppings on the ground. Holes have to be drilled every few feet on the top, side and bottom of the openings, inserts installed and hammered into place and then the cable and tightening turnbuckles installed. Cable run around the openings will hold the netting in place for many years to come. 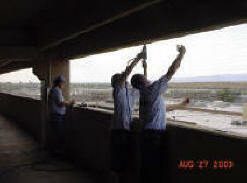 Installing the 2" tan net to each of the openings keeps out the pigeons and blends with the rest of the building. 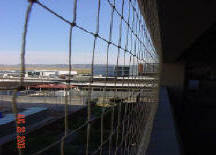 Using black net will hold up better and will look just as good and will not be any more visible than the tan net. 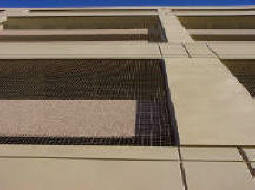 As you can see the net lines run nice and straight and blend with the building. The finished product looks good, will keep out the pigeons for many years to come, will save $ for the owner through reduced cleanup cost and will reduce liabilities from slip and fall hazards. 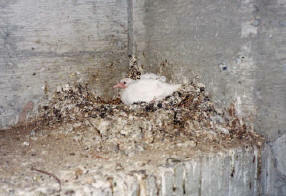 The slope creates a 45 degree angle that the pigeons can't stand or nest on so away they go.